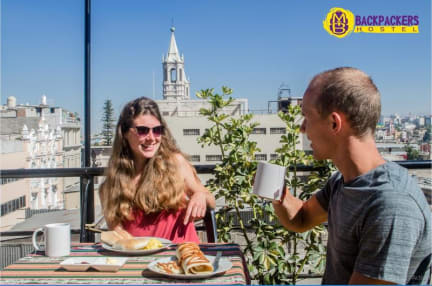 Tours / Travel Desk: We have our own Travel Agency at the hostel and we organize daily groups to the colca canyon with different options (Traditional Colca Canyon 1 or 2 days, 2-3-4 days Colca Canyon trekking, Climbing to the volcanoes Misti and Chachani,we also offer you bus tickets, Rafting, etc. We have more than 10 years experience and we have the best guides and an excellent service,we invite you to read the comments of our tours and services. In the very center. Very helpful staff. Relaxed and friendly atmosphere. Estuve dos veces y en ambas tuve experiencia muy buena. Personal atento, ubicación perfecta, camas comodas y buen desayuno. El sfaff es muy amable y disponible, aconsejo y recomiendo el hostal. Atmosfera amichevole, camere pulite, ad ogni letto è associato un armadietto personale. La location è perfetta, in centro pieno in una delle strade pedonali, il personale è molto simpatico, la colazione ottima. Unica toppa il Wi-Fi funzionava malino, ad ogni modo ci tornerei. I've been to this hostel one night since arriving from Lima. It was one of the best places I've stayed in. Good breakfast, friendly staff, clean bathroom average. Unfortunately, the only negative note is that the hostel is located in the main street very close to the central square so at night a very large area. Trekking in the two-day canyon and one night organized with the hostel is spectacular. The best trekking ever made. 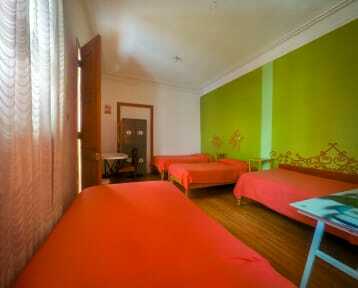 Good hostel in a perfect location, a stone throw from the main square of beautiful Arequipa. Nice staff and tasty breakfast. Only downside: internet and hot water not always available - but this is quite common in Peruvian hostels. Eccellent location. We stayed in a double room which we found located on top of the terrace, very, very basic but above all hot during the day and terribily cold during night. The bathroom is on the roof too. Nice breakfast. Staff very helpful. In conclusion, if you wanna save money can be a choice.